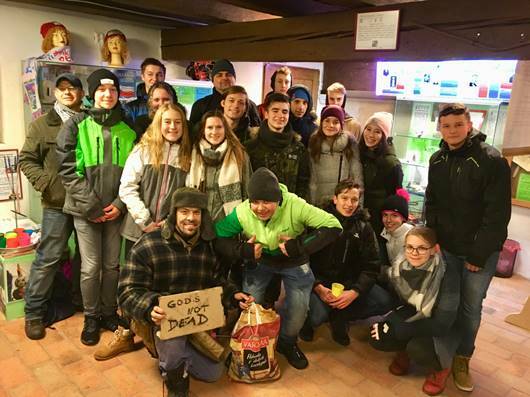 For the most recent update of the Nagy ministry in Hungary, please click in the link below to read their PDF newsletter. Thank you and God bless! 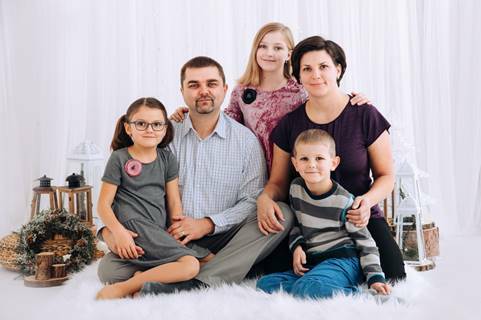 July 1st the leaders of the Hungarian Baptist Union commissioned 3 couples (including us) to plant a new church downtown Budapest. Gyuri was appointed as the leader. We started our Sunday gatherings on July 8th. We can meet in a small room (18 chairs) at the Union’s headquarters (Budapest VI. district, Benczúr utca 31.) near Heroes’ Square. We did advertise neither our plantation, nor our gatherings. First we prayed and asked God to send equipped, experienced laborers. Summer was light, in September Gyuri started to meet young fellows and shared our vision for our church. We would like this church to be the spiritual home for many, especially the highly educated people in Budapest. Slowly people started to come. Not necessary the ones we first hoped for (as usually happens). The Lord has a good plan. 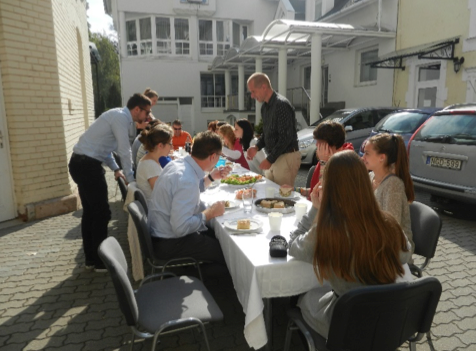 September 2nd we had our first Lord’s Supper together, October 7th we had 19 people and 15 stayed together for lunch outside in the parking lot (seen on the picture). We do not have a music group so we sing with You Tube. 25th October we started our midweek fellowship. We have fellowship one Thursday and teaching course on the other, alternating biweekly. November 8th we were 12 beginning the ROAD TO THE CHURCH course ages from 18-54. 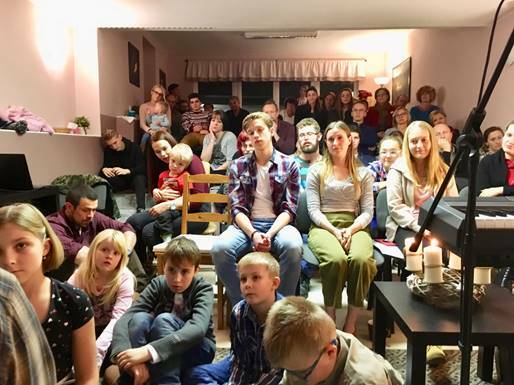 By now we have 15 people who consider themselves belonging to Budapest-Live church. We praise God for them! We have a bigger room (80 chairs) available for us in the building of the Hungarian Baptist Theological Seminary (same site) for free! We are awed by how God goes before us and opens doors. We’ll see when we move over there, maybe in December. 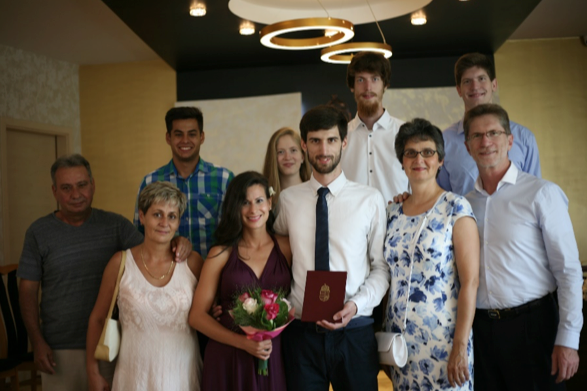 We were delighted to see our oldest son marrying Afroditi (half Greek half Hungarian) 10th August. Gyuri preached and married them, it was very moving emotionally. We all were very happy. They rent an apartment in Budapest. Afroditi works as a Psychologist in a children’s home (parents cannot afford to take care of them). Natan is still working on his masters besides working full time. Aron is developing his design skills and helping with media in our church. 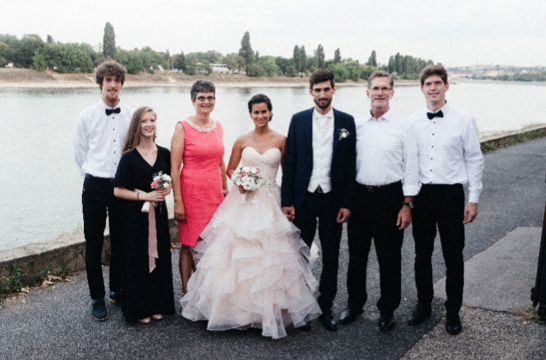 After 2 years in the States Samuel came home for his brother’s wedding last summer. It was hectic but we had some needed serious and fun time together. He reconnected with his brothers and sister. He is asking God to provide for his missing tuition by January, 2019. Abigel began high school, does very well. She has 18 English classes a week. She doesn’t have migraine headaches. She hurt her knees last spring. We saw several doctors. They do not want to operate her knee before she turns 15 (next summer). Until then she cannot do sports and cannot folk dance. This made her cry hard. We prayed together and now she is in peace. She got medicine for her knee. She still has to ware her spine corset during the night. We have a 15 years old Hungarian boy (Mátyás – Matyi) living with us during school days since September. Last 6 years they lived in the USA. 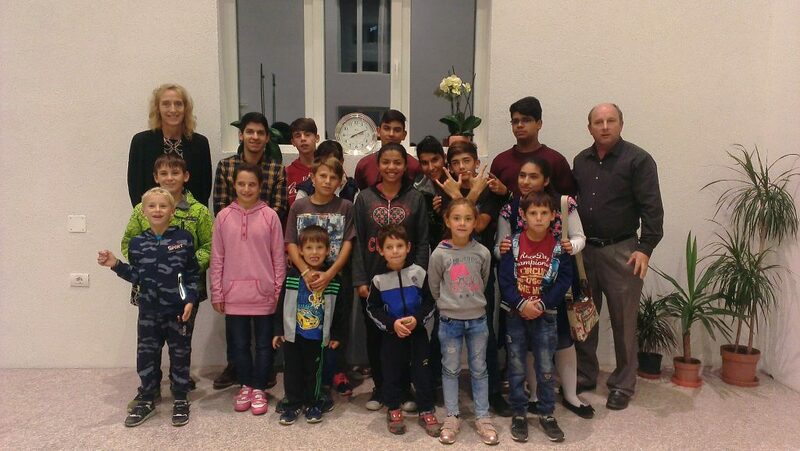 After moving back to Hungary his family lives at Lake Balaton, he goes to the American school in Diosd. It is quite a challenge to all of us, though he is a nice teenager boy. Gyuri is preparing the curriculum for the mentors’ last 5 days training in December. He is working with a pastor personally whose whole family is in trouble. Aniko had a difficult time with her team of 7 women. 5 of them work full time, 4 of them pastor’s wives with children. They don’t have much capacity to do much more for women nationwide. Last May we had a fantastic countrywide women’s conference at Lake Balaton in a school gym. We had to change location 3 weeks before the conference for the interest was so high. We had almost 900 women coming from all over the country, some even from the neighboring countries. Our theme was “Stand up and shine”. 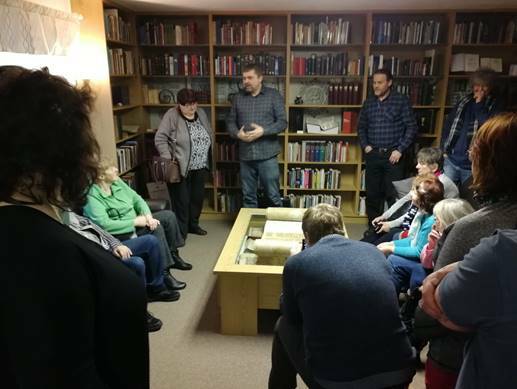 Last weekend we held a prayer day in a village near to the Ukrainian border. 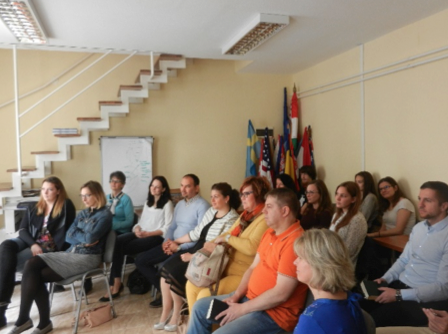 Now we are preparing a teen girls day in Debrecen, a women’s conference in Budapest in May and pastor’s wives days in February and September. We get ready to send out 4000 prayer and fasting brochures to Baptist women all around the country to dedicate the New Year to God and pray for the same requests with the same Scriptures January 1-21. 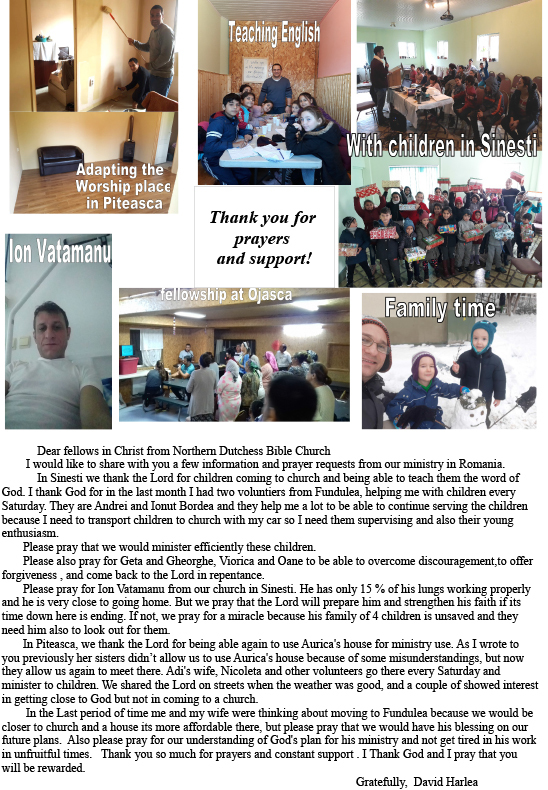 Thanks for your support that enables us to do ministry. We are praying and looking for some additional support since our new church is not able to provide enough for our financial needs.